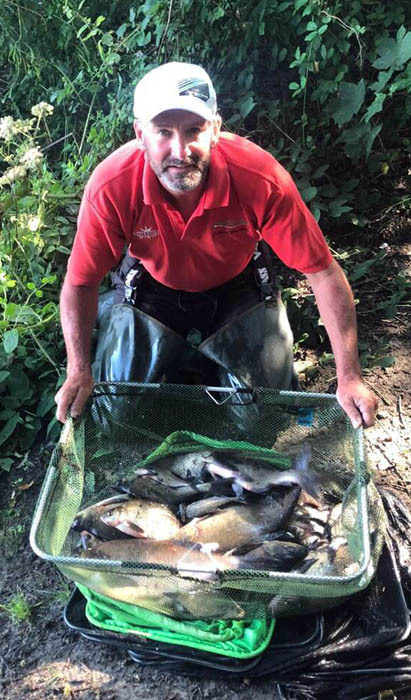 Eddie Bridon continues his fantastic run of form by confirming his place in this year’s Feeder Masters final from one the few remaining qualifier events at Carmill Dam. Eddie has already won Gold with the England Feeder team this year in Italy and recently qualified for this year’s Riverfest final. Eddie has now gone on to confirm his place in September’s Feeder Masters big money two-day final, which will reward the eventual winner with a massive £12,000. Below, Eddie looks back on another superb result, which saw him top his twenty (20) man zone to qualify for another major final. Eddie won his 20 man zone with 26-04-00 to confirm his place in September’s Feeder Masters final. “This latest Feeder Masters qualifier took place at Carmill Dam and saw me on peg 102 on the road side. The area has enjoyed a bit of form of late, so I decided on a two-line approach with one being short at just eighteen (18) metres and a longer line at approx. thirty eight (38) metres“. “I started the match by feeding six (6) large feeder fulls of casters, corn, dead reds & chopped worms to kick start the swim. Choice of tackle for my long line was a 12′ MV-R 2pc feeder rod with a new prototype sinking braid from Maver accompanied by a smart tapered shock leader and a size 14 prototype hook tied to to 0.14mm MV-R hooklength mono. On my shorter line, I opted for an 11′ MV-R 2pc feeder rod with 0.16mm Stone River reel line and a size 16 prototype hook tied to 0.12mm MV-R hooklength mono“. “I started on my short line to give my long line time to settle. In the first thirty mintues of the match I managed to find a couple of skimmers, some small roach, perch & hybrids for around 2lb“. “I then decided to go on to my longer line at thirty eight (38) metres, which produced skimmers and big bream from the off. By this stage in the match, the day was going really well until around 2 o’ clock when a water skier disrupted my peg and the boat he was with turned around on top of where I had been catching! Needless to say, this completely killed the swim! By this time, I’d caught five (5) bream and five (5) big skimmers for around 20lb“. “I decided to get my head down and plod on until the end of the match managing to catch hand-sized skimmers to end the match with 26-04-00. Luckily, despite the events midway through the match, I’d managed to do enough to win my zone and progress through to this year’s Feeder Masters final“. Eddie now joins Emma Pickering in this year’s big money final following her qualification earlier in the year from Southfield Reservoir.